What is going to happen to jobs with all the new technologies that are fast transforming how we work? It’s a subject that raises big questions and a great deal of anxiety. The more our work becomes digital and decentralized, the more it will become streamlined and redundancies will be eliminated. Is this all going to be bad? The World Economic Forum recently published an article by the Chief Human Resources Officer of Unilever, Leena Nair, with the title ‘In the future of work it’s jobs, not people, that will become redundant’. This sounds like good news. The article also states that while jobs will disappear, many new ones will be created, and there will be significant changes in the way that work is organized. As humans, we are free to make choices. Those choices include designing better work for humans. Many organizations perpetuate work practices that are frustrating, wasteful and make little sense. This is because traditional hierarchies and siloed functions create artificial barriers. What the leaders of companies must do instead, as fast as possible, is to design the way people interact systemically to allow work processes and projects to flow across the organization. Not only must leaders design better the work that takes place inside companies, they have to become able to design how people can work together across boundaries. There is a method for this and it was the subject matter of the closing Keynote that our Founder, Dr. Domenico Lepore gave at the Evolving Links event in Madrid this week. 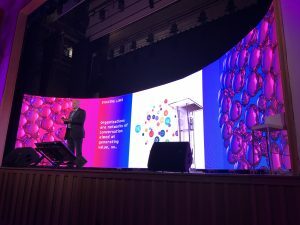 The event was focused on Blockchain technology and it was an opportunity to learn about many of the current applications of Blockchain technology well beyond currency, including supply chain, logistics, energy and healthcare. Domenico was invited to speak about how the distributed thinking and mindset of Blockchain will affect the way organizations behave. It’s a theme that Domenico knows well. After ten years of international implementations of the ‘Decalogue’ systemic management methodology he developed, in 2011, Domenico and a team of experts in the Decalogue wrote the book ‘Sechel: Logic, Language and Tools to Manage Any Organization as a Network’. It was already clear to Domenico at that time that the most intelligent and effective way to organize the way people interact to achieve a goal is as a ‘directed’ network – one with a common goal. Domenico then went on to develop the operational solution for this design that we call the ‘Network of Projects’. This is fully described in the book he was invited to write for CRC Press in 2016, ‘Quality, Involvement, Flow: The Systemic Organization. As Leena Nair pointed out in her article for the World Economic Forum, the world will begin to see an “increasingly borderless workforce”. So how do you organize such a thing effectively? At Intelligent Management, we see clearly how organizations can unlock the potential of everyone in their organization by building the organization as a Network of Projects. This involves mapping competencies needed for projects and scheduling those competencies instead of resources. As some resources have several competencies, this allows for much greater flexibility in scheduling projects and allows people to work more meaningfully by contributing all of their abilities and talents towards a common goal. When work is well designed to accelerate flow, when artificial barriers are removed and people can contribute with all their abilities, we can build not just a future but a better future of work. Intelligent Management is in the testing phase of Ess3ntial. It is a software that visualizes how an organization can work as a network of projects. How? By scheduling multi-projects using the groundbreaking algorithm for project management from the Theory of Constraints called Critical Chain. Unlike other similar products on the market, Ess3ntial is unique because it allows you to schedule competencies, not just resources, and it allows you to monitor the state of buffers using a control chart, leveraging the powerful approach of Statistical Process Control (SPC). We believe it can be the starting point to a significant contribution to a better future of work. We’ll be coming back with more news about Ess3ntial very soon. The post Building a Better Future of Work appeared first on Intelligent Management.